Graduates of BYU form a remarkable group of accomplished individuals with strong values and firm faith. I hope you hold her in fond remembrance and that the more you look about this world, the more you treasure what she did for you. Here you learned the skills, the basic knowledge which has blessed your life ever since. And here, at the feet of a remarkable faculty, you developed a strong and solid knowledge of the gospel of Jesus Christ and the faith which grows out of such knowledge. The seeds of testimony planted and nurtured in those early days have grown into tall and rugged trees of faith, which bring shelter and beauty to many around you. The Church made a significant investment in you, and you have returned it with interest. You are men and women who love the Lord, who get on your knees and pray to your Father in Heaven, who serve wherever you are called to serve and in whatever capacity, who honor and love and appreciate your companions, many of whom are likewise the products of BYU. You know the true meaning of fatherhood and motherhood, a relationship you share with your Father in Heaven, who is the Father of the spirits of all of us. What a remarkable group you are. You serve on the faculties of most of the universities of America, as well as others abroad. You are scientists who are making a tremendous contribution with your discoveries and research. You are doctors and dentists and lawyers. You are architects and engineers. You are educators, school administrators, sociologists, biologists, economists, and business executives. You are good people who love the Lord and who in turn are loved by Him. In the years to come your ranks will be enlarged by many thousands more. Your alma mater will grow in the respect of leaders throughout the earth who will increasingly recognize the unique abilities and unusual qualities of BYU graduates. The stature of BYU graduates will enhance the good name of the Church wherever they go and do inestimable good in advancing the work of the Lord. The greatest thing that BYU will give its students in the future is what it has given you in the past. That is an unshakable faith in the living God, He who governs the universe and who is also our Father in Heaven to whom we may go in prayer. It is faith in the most remarkable vision in human history, the appearance of the Father and the Son to the boy Joseph to usher in this, the dispensation of the fulness of times. It is faith in the Book of Mormon as a second witness of the reality and the divinity of the Lord Jesus Christ. It is faith in the holy priesthood conferred upon you, my brethren, and under the authority of which you act as a servant of the Lord. 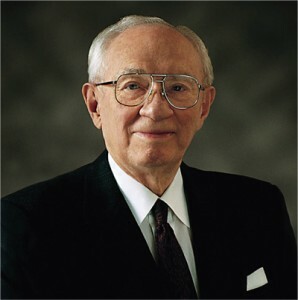 It is these pillars of faith—which most of you first acquired from your good fathers and mothers and which were greatly strengthened when you attended BYU—that today sustain you and bless you wherever you are. Hold fast to them. Magnify them. Treasure them. God bless you, my beloved associates in this great work. We are immensely proud of you. Go forward with faith in the living God and trust in our divine Redeemer, His Son. Serve well in the Church, which is Their creation. Walk with integrity before the world and rear your families “in the nurture and admonition of the Lord” (Eph. 6:4). May heaven smile upon you as you go forward with your lives is my humble prayer, in the name of Jesus Christ, Amen. This article is adapted from an address given by Gordon B. Hinckley, President of The Church of Jesus Christ of Latter-day Saints, on Nov. 7, 2003, at the Worldwide Alumni Gathering.